Online backup and storage services are becoming popular as broadband internet is become affordable. Mozy is one of the most well established and popular online backup and storage service which has years of experience on their backs. While there are many competent online storage and backup providers out there, only a handful of them deserves your hard earned money. Mozy is among the most trusted and easy to use online backup solutions. Dropbox may have become more popular when it comes to storing your pictures and files directly from your smartphones, Mozy remains the paladin in the desktop industry. Mozy is owned by EMC Corporation and it is based in Seattle, Washington. It’s a company which specializes in cloud based storage and provides services for both Windows PC users as well as Mac fans. Back when Mozy was launched in 2005 it was remarkable innovative, unique and provided a very affordable plan. But as years rolled by many new competitors came forward. Mozy also had to drop the unlimited storage plan from their offering, this definitely impacted their reputation and popularity. Still Mozy is a very reliable and user friendly online backup solution. Mozy is very specific when it comes to providing information about what they can do for you. They will simply back up your hard drive’s content online and whenever you need to retrieve it, they will provide you a number of easy was to do so. Multiple packages – Mozy has online backup solutions for all. If you just want to save pictures or backup your home computer, then Mozy Home is the best choice for you. There is even a free version available for up to 2 GB of storage space. If you a small business owner and need to save files form multiple computers and servers, then Mozy Pro will be the better selection. Similarly there is Mozy enterprise which provides solutions of enterprises. Easy installation – Mozy is fairly easy to install on any system you are using. There is a simple client which is of only 12 MB, you simply need to install it on your Mac or Windows personal computer and you are good to go. OS integration – Mozy integrates itself with the operating system well. After you install the client, you will get the option of “backup to Mozy’ whenever you right click any file on your PC. Need to backup multiple files? Simply select them all and backup. Accessibility – Mozy is a very accessible online storage client. You can easily launch Mozy from your desktop if you have installed the local client. Or you can access your storage files using the web browser based terminal. Both ways have their own benefits, the web based one has a very clean interface which is easy to use while the local client presents robust options. DVD restoration – If you happen to lose all your data, don’t have access to internet of the files are simply too large to download in a small period of time, Mozy will send over DVDs with your data written on them to you. Mobile apps – Just like Dropbox, Mozy also provides you with mobile apps so that you can backup contents of your smartphone online. The Mozy app is available on the Google Play Store for Android and App marketplace for iOS based smartphones. No cost for small data – Mozy provides you with 2 GB of free storage when you sign up without any cost whatsoever. This makes it the best choice for small data safety and storage. Critical data can be stored on Mozy and will be fully retrievable anytime you need. The best part is that you don’t have to pay a single penny. 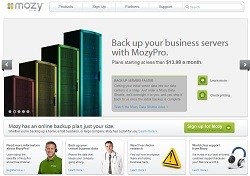 Mozy is an overall great online backup solution and provides you with a reliable service. The only thing which is slightly negative is that Mozy does not provide you with unlimited storage space. While many other online backup services provide you with unlimited space, Mozy remains constraint. This is probably the only disadvantage of using Mozy over any other service. If you are a business owner who needs to save critical data online and wants to have all the files available at any time, Mozy might be a little backwards. But if you only need 50 GB or 125 GB of storage space, Mozy is a great deal. Mozy has very reasonable prices, it has been the same the day it was launched. A part of Mozy’s fame came from the unbelievable low and affordable prices when it came into being in 2005 and to this day the prices remain great. 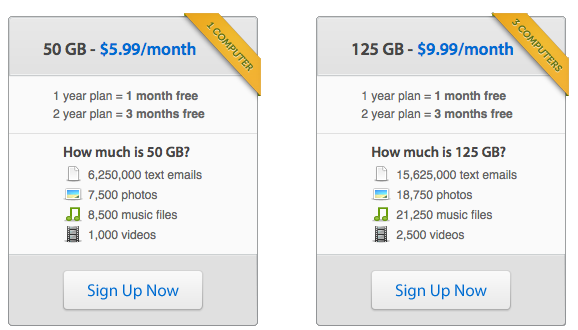 You can get 50 GB of storage for only $5.99 a month, but if you subscribe for a year you save 8% and the same storage is offered at $65.89 instead of the $71.88 it would have cost. If you subscribe for 2 years you get a further discount and you can get the service for $125. If you need a bit more storage you can get the 125 GB version for $9.99 per month, $109.89 for a year and $209.79 for two year duration. Mozy provides you with quality customer care but only if you are a subscribed paying customer. This is understandable on their part. But you won’t be getting 24/7 phone support with Mozy Home subscriptions. You will only get live chat or ticket based support if you are a Mozy Home user. 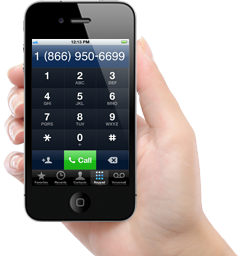 The other Mozy Pro and Mozy Enterprise will get 24/7 phone support. Mozy is a reliable and very easy to use online cloud storage service. The backup and restore functions are very optimized and the client never runs into bugs. Mozy does everything a file storage is supposed to do and do it really well. Mozy is a great choice for those who just want to save their pictures and important documents online and have the peace of mind that their data is in a safe place.